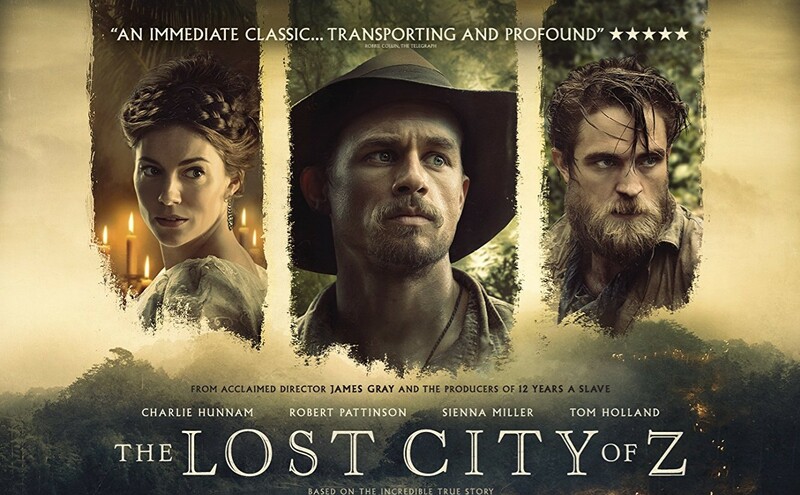 The Lost City of Z is an Amazon production that packs a somber story about Percy Fawcett, an explorer who was on the right track in looking for a fabled city of ancient technological advances never before seen in South America. Unfortunately, he disappeared in 1925 during is quest. The film stars Charlie Hunnam, Robert Pattinson, Sienna Miller, Tom Holland, Ian McDiarmid and a whole bunch of opinionated old men playing important political figures in the British realm of government. It's weird watching "Jax" in a period piece with no motorcycles, but as the film proceeds, you get acclimated to Hunnam playing British explorer Col. Percival Fawcett, a man's man of men. In the film we see Fawcett perceived as a non-player in the political system, and thus, never quite gets up in the ranks of society while getting the crap assignments in the military, including being sent to the Amazon (Amazonia) on some crazy assignment. An assingment that can take several years of his life. When he gets his assingment to head to South America, he has Henry Costin (Pattinson) join him on his dangerous journey. We follow Fawcett as he takes multiple trips to the Amazon. The first trip is when he discovers pottery in the jungle, which shows him the evidence that there were more than just local natives in the jungle, despite all the elder statesmen of Britain poo-pooing the premise that there are natives on par with British society out in the jungles of "Amazonia." The film is a dry rendition of the man's pursuit of what he fervently believes is a critical discovery waiting to be found and lend an important piece of achealogical history to humanity. Otherwise, this is a great cast and it's nice to see Hunnam hitting up other roles to expand beyond his type casting from playing Jax in Sons of Anarchy. Pattinson looks and acts different enough to play the part of Costin well. And this is the early 1900's, so travelling the Amazon had it's challenges as his crew drops from various... issues. This is not your typical action-adventure film, but rather, a somber representation of an ill-fated destiny, that of which, has some fanciful ideas on how Percy and his eldest son (Holland) disappeared. Hey, one theory is just as good as the other. The film got a 6.6/10 on IMDb and receveid an 87% from Rotten Tomatoes. It was a good film for a quiet evening of a bit of history.